The town of Malu began growing grapes in 1981. Thanks to continuous explorations and improvements for over 20 years, Malu today produces more than 70 varieties of grape. These varieties can be classified into three major categories according to the time of maturity: early, middle and late. 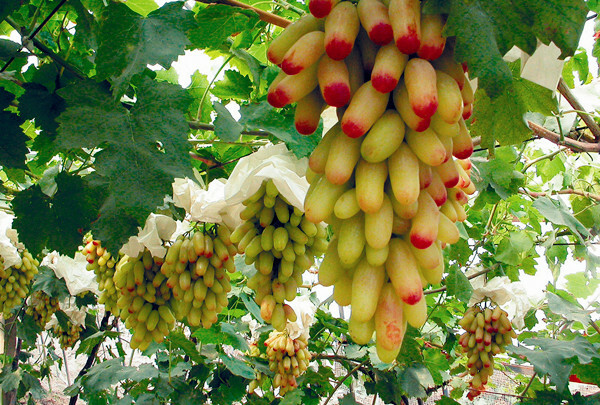 The main varieties are Jufeng, Tengren, seedless Baijixin, Rizamat, pink Yadumi, August, giant rose, autumn red, Xile and Jingya. The acreage of cultivation is more than 3 million hectares. Malu established the Malu Grape Research Institute in 1992. The town was named China's "Land of Grapes" by the Ministry of Agriculture in 1999. The research institute was upgraded into the Shanghai Grape Research Institute in 2000. The Malu-brand grapes won the gold prize for Shanghai's best grape in 2001 and passed Shanghai's best farm product certification in 2002, becoming one of the earliest safe, healthy and quality farm products in Shanghai's suburban areas. In keeping with the rapid development of the grape industry, Malu established Grape Development Ltd and built a production base of 666,666.67 hectares for quality grapes in 2003. The town established the Malu Grape Specialized Cooperative in 2004, with a task to organize the peasants to pursue common development and common prosperity.